My last day of trying out/breaking in my new pair of FiveFingers KSOs consisted of finally running. I did about two miles around my neighborhood–mostly hills. I immediately struggled to figure out how to run in these things. Would I have to run on my toes the whole time? I could see why athletes rely on FiveFingers to strengthen their lower legs, as my calves were burning after about two minutes! I especially had trouble running downhill. I like to open my stride and let gravity, and my cushy shoes, do all the work. That wasn’t an option in my new shoes. Trying to run downhill without heel-striking was nearly impossible for me. 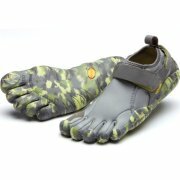 My workout was definitely enhanced by FiveFingers. My legs fatigued pretty quickly, and maintaining form sapped my cardio as well. Is this the proper way to run “barefoot?” Can any runners out there provide some assistance? I could barely walk for three days after this run. I felt like a dog was gnawing on my calves with each step. Again, runners, should there be so much soreness? I thought since I wasn’t starting from scratch with the barefoot training concept I would be all right. Boy, was I wrong! My final verdict? FiveFingers rock five stars! I’m glad I made the investment. Despite the soreness caused by running on pavement my first time, I love working out in these shoes. I plan on trying many other activities and will post on them if you’re interested. Be on the lookout for a long-overdue post on Machida’s loss to Shogun and some requested posts about building a practical home gym. Thanks for reading! PS – I just received a back-ordered pair of Flows. They’re a bit heavier and made of a neoprene upper to help insulate in cold weather. I tried these out over the last few days, and I like the fit better (they’re a men’s 42), but they’re a little harder to put on. The toe pockets are thicker, so you have to press the material down between your toes. I look forward to wearing these a lot more when the temps drop again. They should be especially nice when rolling in my friend’s garage: my feet usually turn blue! I could barely walk for three days after this run. I felt like a dog was gnawing on my calves with each step. Just got some compliments at the gym today. If you want to look cool, they’re worth the money! PS – I haven’t stepped foot in a gym for about five years, so it was nice to be noticed! I definitely wasn’t used to the workout there. I’ll probably post about my home gym soon, so you’ll have to tell me what you think! Thanks for the help, Lynch! I feel like I am doggie-paddling while running in these shoes. I like the video you posted here. The woman running is very erect in posture and smooth in stride. I’m going to have to get out and practice soon!